We have reached the final strectch! 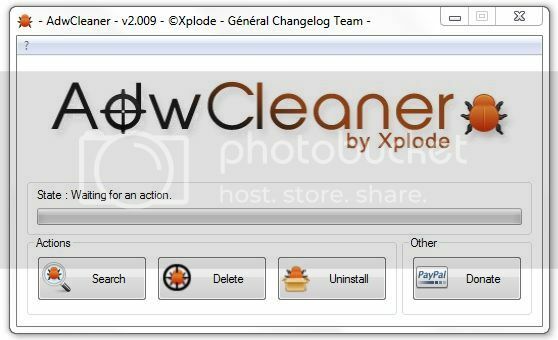 Download AdwCleaner from here or here and save it to your desktop. Once it has completed it will ask to reboot the computer, please allow it to so. After the computer reboots, a log will be produced. Please attach that log to your next post. Apologize for this delayed response. Did not see your post on the new page..
That's okay, I actually missing posts sometimes for the same reason. I've been in and out this morning starting to get things lined up for the children for school so the timing was perfect. Yeah, it's that time again. My oldest starts back with marching band practice all day, Monday-Friday next week. The youngest two and I have a bit more time, we all start back the 3rd week of August. Doesn't seem like summer should be almost over yet!! A few things that need to be updated. HijackThis-This is a program you can uninstall. It was the program that was used prior to OTL. Your current version of Adobe Reader is out of date. Please go here to download the most current version. Give this restore point a descriptive name and click Create. I greatly apprecately your patience and sticking with me until the end on this one. The following are recommendations for future use and protection if necessary. If you have any questions, feel free to ask. I have not been able to work on anything today..have been busy. Will perform the tests/upgrades tomorrow morning. That's fine. Whenever you get the chance is okay. Have a good evening. I am using Windows Vista. Could I get directions on this please.. Unable to uninstall. Says ComboFix cannot be found.. Many logs are stored in .txt files, do we need to keep them? We had changed our BIOS setup, does it need to be restored? I am currently using Trend Micro as antivirus software. Per your recommendations, I will download all the necessary housecleaning software. What should I do about my current one? Do we need to delete and keep one? Lastly, You and your team (Essexboy) were commendable in helping me thru the virus/ malware cleanup. Cannot imagine the status of my system without your expertise. Thank you both very much and to this forum for great support. If in any way we could contribute and give you rating, please let me know. The process is the same for Windows 7 & Vista. The OTL Cleanup may remove it so you can skip over that step. I'll go through the list here. Those can now be deleted. You can change it back, but left the same as long as there isn't a bootable USB in the computer it will skip over it in the boot order and go directly to your hard drive. What I give are just recommendations if you'd like to change in the future. Trend Micro is a reputable antivirus as long as it is updated you should be fine. You're welcome!! Glad we were able to help!